He has been charged by the RFL's match review panel with a dangerous tackle on Wakefield's Reece Lyne during Friday's 30-20 loss. 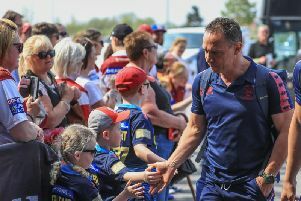 No other players face bans despite the criticism of Trinity coach Chris Chester after the match about "a lot of naughty stuff" which went on, saying some of the challenges were "ridiculous". And his star player David Fifita even took to Twitter the following day to lash out at the "cheap s**t" which he said threatened his career, accompanying his rant with a video clip of debutant Joe Shorrocks tackling him at knee level. Shorrocks has copped a Grade A charge but isn't facing a ban, while Wakefield's Pauli Pauli has the same charge for lashing out at Oliver Gildart at the end of the match. Powell, who was placed on report for the challenge, was making his comeback from a spell on the sidelines through injury. The normal sentence guidelines for a Grade C offence is two to three matches. No players from St Helens - their opponents on Good Friday - are facing bans. Saints, meanwhile, have announced they have sold 5,000 tickets for the Good Friday derby.